The last few days I've been in a purple mood (by the way, I adore purple eye shadows), and here are the looks I've worn over the last three days. 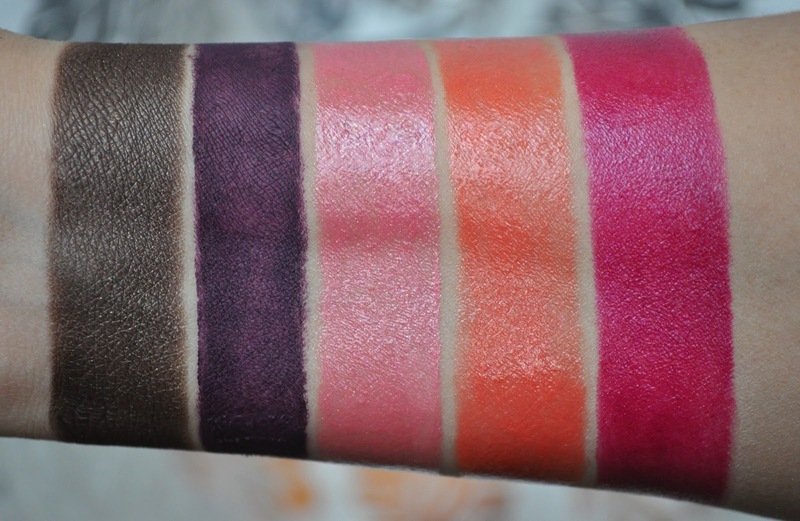 As always, swatches of all the products used (minus Guerlain's Blush G Sakura Cherry Blossom Blush. I love the blush, but it's a pain in the arse to swatch, so please click here for the swatches). Guerlain Ecrin 4 Couleurs 501 Attrape-Coeur (the colors are a little muted due to overcast weather). 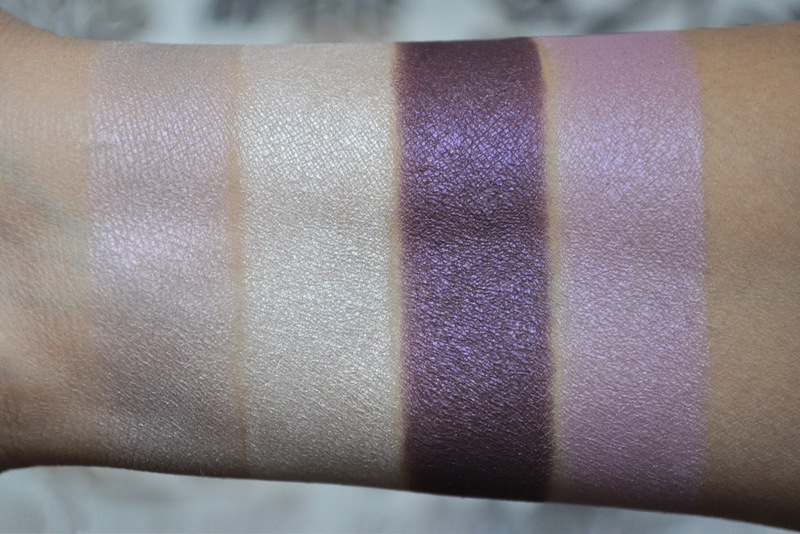 I almost passed up Attrape-Coeur (as I have a ton of purple shadows), and I would be kicking myself if I had. A big thank you goes to my darling Kate for helping me get my hands on this gem. If you love purple eye shadows, Attrape-Coeur is for you. Attrape-Coeur is on sale on selfridges.com and in store. From left to right: Guerlain Ombre Eclat 1 Couleur 187 L'instant d'un Soupir, Cils D'Enfer Maxi Lash 02 Violet, Serie Noir Rouge G Lipstick 71 Rose Desir and Orange Euphorique 45, Shine Automatique Lipstick 761 Flirt. I cut my hair two weeks ago. I told him to cut an inch, he cut 4! Guerlain Blush G Sakura Cherry Blossom Blush (swirl blush brush into all the shades). 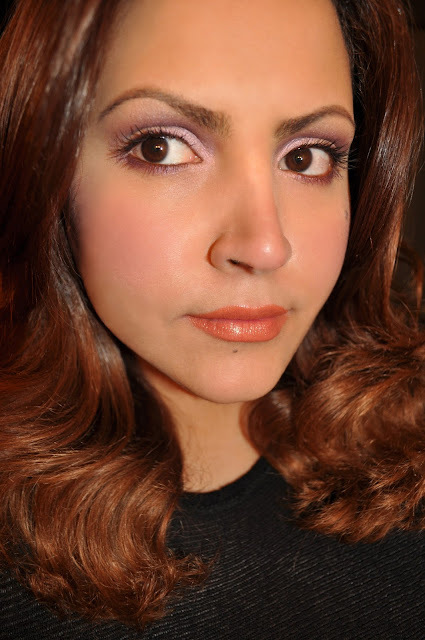 The pale mauve-lilac shadow all over the lid and inner corner. The shimmery dark purple shadow in the crease and lower lashline. Guerlain Ombre Eclat 1 Couleur 187 L'instant d'un Soupir (used to line the upper lashline). Urban Decay 24/7 Glide-On Eye Pencil in Bourbon (the waterline). Guerlain Cils D'Enfer Maxi Lash 02 Violet (upper and lower lashes). Guerlain Serie Noir Rouge G Lipstick in Orange Euphorique 45. Guerlain Blush G Sakura Cherry Blossom Blush (swirl blush brush on just the peach and white shade). The shimmery dark purple shadow all over the lid, in the crease and lower lashline. The Shimmer white lightly placed in the inner corner and brow bone. 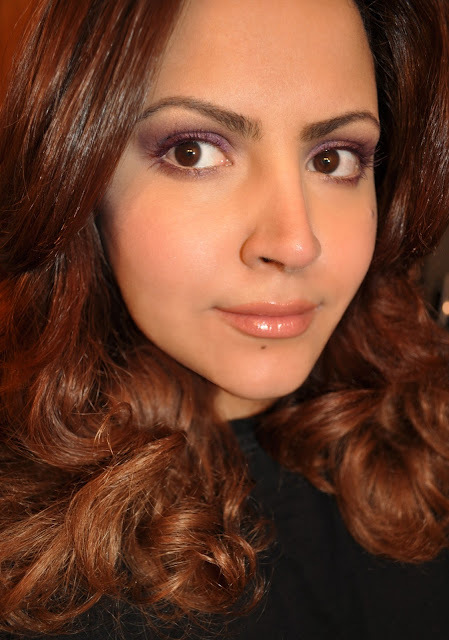 The Shimmery dark purple blended heavily on the upper lashline. Guerlain Ombre Eclat 1 Couleur 187 L'instant d'un Soupir (used lightly in the crease for blending ). Mac Chromagraphic Pencil in NC15/NW20 (on the waterline). Mac Lip Pencil in Oak. Guerlain Serie Noir Rouge G Lipstick in Rose Desir 71. Guerlain Blush G Sakura Cherry Blossom Blush (swirl blush brush into the two pink shades). 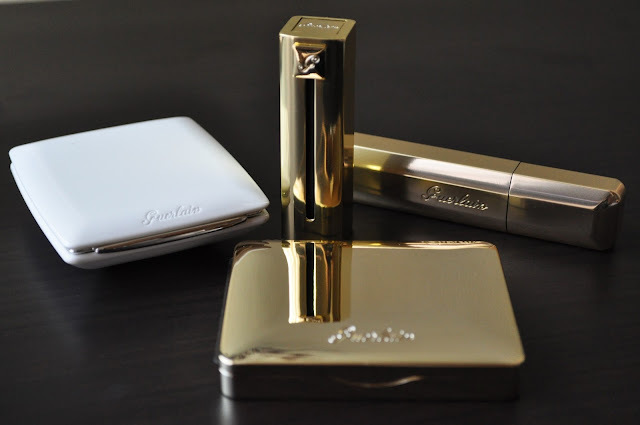 Guerlain Ombre Eclat 1 Couleur 187 L'instant d'un Soupir (All over the lid, crease and pressed into in lower lashes). 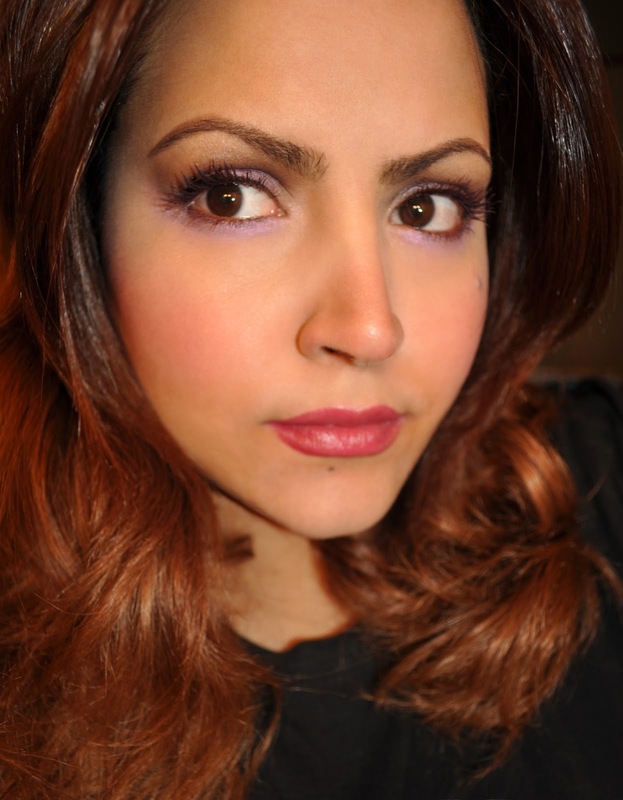 The deep pinkish-lavender shade placed on the middle of the lid and lower lashline. Guerlain Shine Automatique Lipstick 761 Flirt. What color are you loving this week? Every look is gorgeous, but the third is especially beautiful on you! RH . Mon natuгеl est plutôt souriant.